Welcome to the American Samoa National Park Information Page. The Samoan archipelago includes the US Territory of American Samoa and the independent nation of Samoa (formerly Western Samoa).The islands are located 2,600 miles southwest of Hawaii and 1,800 miles northwest of New Zealand, between Fiji and Tahiti. The Samoan chain stretches east to west for more than 300 miles between 13 and 15 degree south latitude (below the equator). It is just east of the international dateline, in the timezone that is one hour earlier than Hawaii. The nearest airport is Pago Pago International Airport on Tutuila. Airplane service is available several times per week from Honolulu. Regularly scheduled flights (small planes) serve park areas of Ofu and Tau, and the nearby nation of Samoa. Several car rental facilities are available at the airport and/or on the island. Taxis are available at the airport, and near the market in Fagatogo. The island of Tutuila has good public transportation (frequent, but unscheduled) via “aiga” or “family” buses. For 50 cents to a dollar you can be taken around Pago Pago Harbor, and to some of the more remote parts of the island. Buses originate and terminate at the market in Fagatogo, the village right next to Pago Pago. The roads are generally too narrow and the traffic to busy for bicycles. Located some 2,600 miles southwest of Hawai`i, this is one of the most remote national parks in the United States. It is also one of the newest; it was authorized by the U.S. Congress in 1988 and officially established in 1993 when a 50 year lease was signed. American Samoa, the only US Territory south of the equator, consists of five rugged, highly eroded; volcanic islands, and two coral atolls. The land area of the territory is 76 square miles. The population is approximately 60,000, with most people living on the main island of Tutuila. Tuna fishing and canning are major industries. Many Samoans practice subsistence farming. The nation of Samoa lies 60 miles to the west of Tutuila. The main islands of ‘Upolu and Savai’i constitute a much larger land area than American Samoa. Between these two large islands are the small islands of Manono and Apolima. Several uninhibited islets lie just off the eastern shore of ‘Upolu. The Pacific Ocean occupies a third of the Earth’s surface. Of the thousands of islands scattered throughout this vast world of water, most are not large enough or hospitable enough for humans to live on. There are some, such as the Samoa Islands, that possess such beauty and exotic quality that they have inspired works by artists and writers. The Samoa Islands are part of Polynesia, a triangular area of the Pacific bounded by Hawaii, New Zealand, and Easter Island. The Samoa Islands have been populated for 3,000 years, but known to the Western world for little more than two centuries. So important is Samoa to Polynesian culture that some believe this was where all Polynesian people originated. The visitor center at Pago Plaza, one scenic over-look (Amalau Valley), and the 1/4 mile gravel trail to the Pola is wheelchair accessable. No other pull-outs or over-looks have been developed at this time and trails are unimproved, extremely steep and rugged. The roads are generally too narrow and the traffic to busy for bicycles. Si’u Point is the dramatic southern coast of Ta’u, where waves crash against rocky coast and sea cliffs stairstep to the 3,000 foot summit of Lata Mountain. These are some of the tallest sea cliffs in the world. There is a foot trail out towards Pola Island from the village of Vatia. Mount Alava lies to the north of Pago Pago Harbor. A hiking trail along the maintenance road leads to the 1610 foot summit; the trailhead is located at Fagasa Pass, a short drive west of Pago Pago. The hike is 6 miles round trip; allow 3 hours for your hike up and 2 hours for your return to the pass. There is hotel-style lodging on all three islands. Camping is prohibited within the park. Samoan people are hospitable and eager to share their culture with park visitors. For a cultural experience visitors should consider staying with local families in their fale (FAH-lay) or house. This unique opportunity will allow you to learn about the Samoan culture and lifestyle first-hand, as well as assisting the village economy. Homestays can be arranged in the village of Vatia. Contact the park office for more information. On the island of Ofu, you will find coconut palms swaying in the warm ocean breeze along a secluded beach, views of distant mountains of Olosega, and the best snorkeling waters in the park. Your must bring gear from Tutuila. Before you visit Ofu check with park staff about special rules that apply. A new park visitor center is located in Pago Plaza office building located on the island of Tutuila. Solar radiation is intense! Wear sunglasses, sunscreen, a hat, and protective clothing. Always snorkel with a partner. While on beach areas, watch out for falling coconuts. Whatever beach you are on be aware of the tidal movements and be alert for the avas, tidal outflows from the reef. These are dangerous, their currents and undertows should not be underestimated. Coral rubble beaches are difficult to walk on; watch your step. Be especially careful of rocky areas, which are slippery. Ask the Visitor Center about trail conditions. Never hike without water; carry 2 to 3 liters per person. Don’t touch the coral! Cuts from coral take a long time to heal. Medical treatment is available on Tutuila. 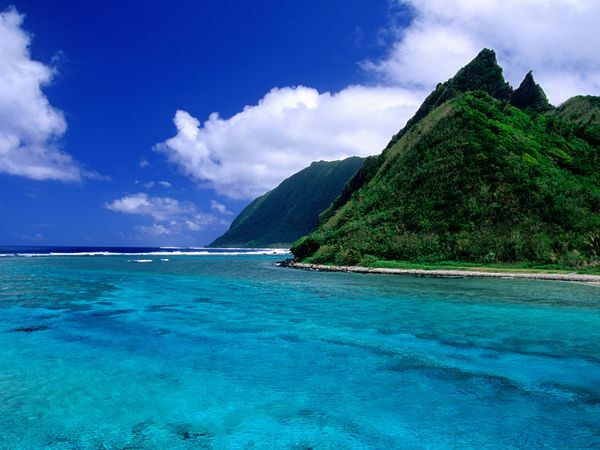 American Samoa is in the South Pacific Ocean, between the Equator and the Tropic of Capricorn. A tropical climate prevails. Temperatures are warm or hot year-round (high 70’s to low 90’s F) with high humidity. Rain showers are frequent. Rain showers may last only for a few minutes, or last all day. The average annual rainfall in the drier portions of the island is 125 inches and 200 inches elsewhere. Tropical storms are more prevalent during the rainy season (November to May). Plan to dress lightly; sandals, shorts and short sleeved shirts are suggested. Rain gear is always appropriate, but remember the high humidity; you may get just as wet wearing your raincoat as not! If you plan to hike in the park’s interior, wear sturdy boots. Since the islands are volcanic in nature, lava rubble is found everywhere; it can be rough on lesser quality boots and shoes. Bring your own snorkel equipment, especially when visiting Ofu island. Lastly, if you’d like to be closer to the local culture, you may wish to try a “lava lava”, a skirt-like garment worn by both men and women in various styles and lengths. They are available at many local stores. It is customary in Samoa to cover much of the body. Even when swimming, be sure to wear modest clothing; no bikinis, please.